Coming from Massachusetts, my husband and I planned ahead for the license, hair, limo but then other parts we just let the chips fly where they may. I hope our experience helps others. Tip: Since the office is only three blocks from Fremont Street, take the bus from your strip hotel to the bureau, complete the license process, and then continued on to Freemont. When we went in the morning, the line at Clark County office was short, but we’ve heard it can be quite busy there. There was plenty of people watching there too, oh boy. My wedding dress was short and made of material that I was comfortable could travel in my suitcase. Believe me, you should have a plan for how to transport your dress and if it can be ironed or pressed once you arrive if needed. Another idea is to contact the airline about rules for where you could possibly hang the dress. It never hurts to ask. Turn on the bride charm. If you have your nails done before you go, bring polish and buy some remover at the local convenient store on the strip. My nails started to chip on the day of my wedding and I was so happy to have brought extra. We knew this from just being to Vegas before on vacation. My advice is spend some time looking online and see which one fits your personality and budget the best. For us, we decide on Vegas Weddings www.702wedding.com because I wanted to get married outside and I liked how this was arranged on the rooftop with the city lights in the background. 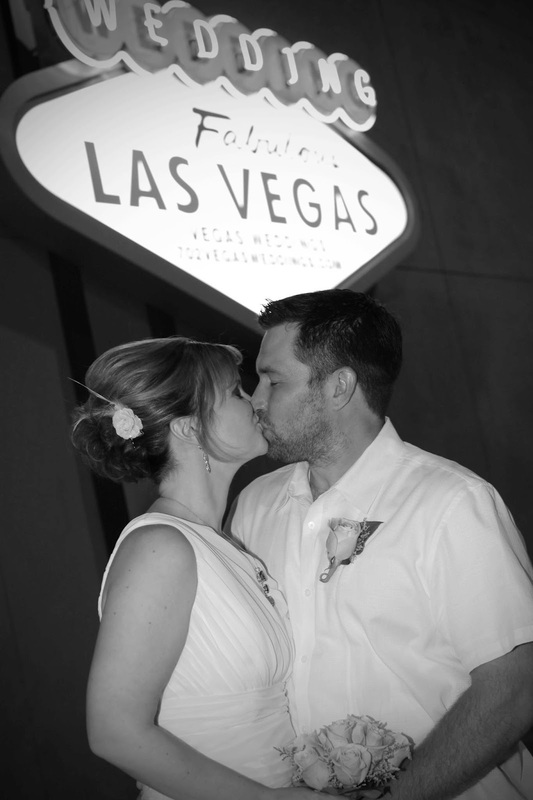 Like many marriage locations in Vegas, there were flowers provided for me and my husband and options for picture packages. Also included was a limo that picked us up at NYNY and then drove us back. Our limo driver was extremely friendly and when he drove us back to our hotel he took us “the long way” so we could enjoy the ride and see more of the city. This is also located across the street from the Marriage License Bureau so when we went to finalize the license it was an easy walk over to check it out. Funny story: We were called the morning of our summer wedding to say there was bad news; it was going to rain so we needed to move our wedding inside. I did not want that! We decided to push our luck (it is Vegas, you know) and we would take our chances. All day we kept hearing from card dealers and even on the news about the humidity and coming rain. The wedding coordinator even called us again to ask if we were sure. In the end, there was a slight sprinkle of rain late that night and it was just a few drops. Crisis diverted and we love to tell this story because we are hearty northerners. I just want to give a quick nod to NYNY for being an amazing hotel. When I knew we were going to stay there for our wedding night and a few nights after, I called and talked to the front desk. The woman told me there would be something “waiting for us” when we checked in. I assumed this would be chocolates or something with a heart on it so, to my surprise and delight, I couldn’t believe when we checked in and they told us we were upgraded to a spa room with a card and note wishing us a long and happy marriage. We’ve stayed in Vegas many times, but this place will also be extra special as the hotel where we stayed as husband and wife. I wanted to be pampered at least a little for my wedding which for me meant having my hair and make-up done. Other options, including enjoying the numerous spas all over Vegas, are also great ways to enjoy youself and relax. I was so surprised by the convenience, cost, and results. 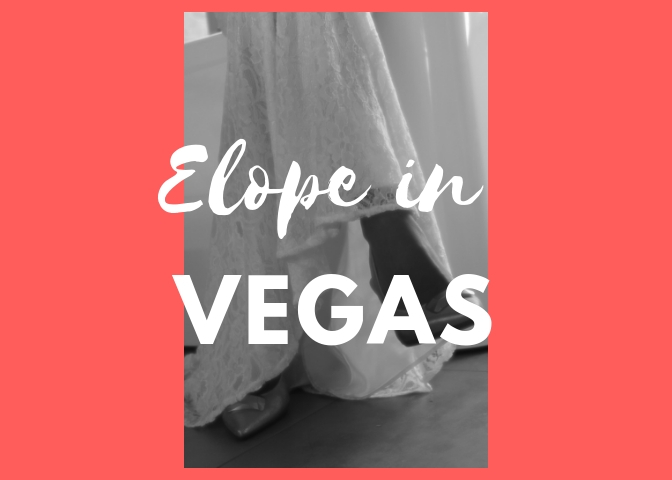 I was nervous about this part of our wedding and my crazy imagination took over expecting to have to meet someone somewhere in a dirty, scary off strip building and spending a ton of money sitting alone in a cold salon chair. Nope. That didn’t happen. 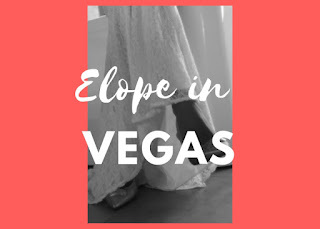 Before coming to Vegas, I contacted Pampered Brides of Las Vegas. My consultant was amazing. She came to my hotel room, did my hair and make-up and was wonderfully friendly talking to me the whole time like we were old friends. Did I mention the price was so reasonable! When we arrived in Vegas, I simply called and gave the hotel and room number. The appointment was about 1.5 hours long and worth every penny. We Got Married, Now What? So maybe we’re crazy for not wanting a fancy dinner after the ceremony, but then again if we wanted that why would we elope? We wanted to do whatever makes us happy and not worry about seating or arranged dinners, etc. So, what did we do? We ate pizza! No joke. We returned to NYNY and went right to their amazing pizza shop of the casino floor and ordered a pie. Still dressed in our wedding attire, we carried that pizza back to our room. Of course we received numerous congrats and smiles which was wonderful too. Eating pizza in my pj’s laughing and watching favorite movies with my new husband was perfect. The thoughts, recommendations, and ideas in this blog are completely my own. 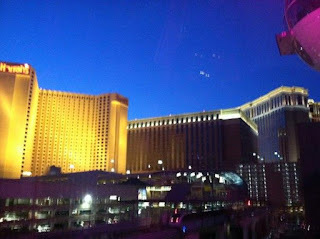 For more on Vegas and our adventures, please check out my blog or page on Facebook.